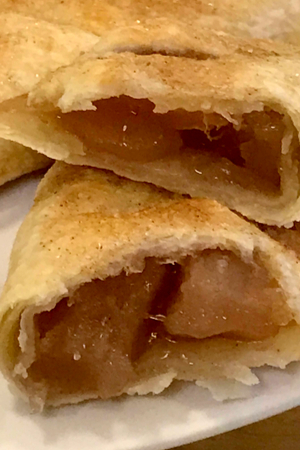 These delicious Air Fryer Apple Hand Pies are a great way to get a taste of classic apple pie without using any utensils! So what exactly is a hand pie? 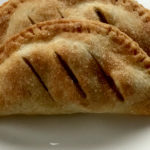 Air Fryer Apple Hand Pies – a quick and easy dessert. Think of the Hostess brand fruit pies that are sold at nearly every grocery and convenience store? You know the ones that sit at the end of the junk food aisle along with the donuts. You have your choice of apple, cherry, and even lemon pies. They come in individual servings and all you have to do is peel back the wrapper and take a bite. I haven’t looked for them in a while, so I am not sure if they are even still available. If you don’t have a biscuit cutter, you can cut the dough by using a bowl or large glass cup instead. But I started thinking about them one evening after dinner when we were thinking about making a dessert. We had no pre-made desserts in the house so I opened the fridge and pantry to see what we make. I opened the cupboard and saw we had chocolate chips, brownie mix, peanut butter and apple pie filling. Sometimes a spoonful of peanut butter or Instant Pot Caramel will satisfy the sweet tooth, but not on this particular day. The craving for sweets was much more prominent after we had a classic comfort meal for dinner. Place the apple pie filling in the center of the circle. But because it was already well into the evening, we knew it had to be something quick. Brownies, cookies, and a traditional apple pie would simply take too long to make. So I popped open the refrigerator door to see if anything jumped out at me. On the top shelf sat a box of pre-made pie crust. That is when the hand pies idea came about. I had just purchased my BCP 5.5 quart air fryer and was frequently using it to cook several things. Cut 3 slits in the top of the dough to allow it to vent during the cooking process. 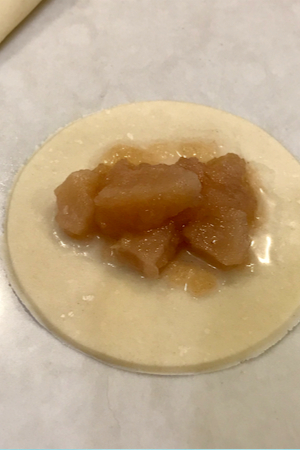 So I thought to myself, why not use the pie crust and apple pie filling to make Air Fryer Apple Hand Pies? I pulled the crust out the fridge and the apple pie filling from the pantry and got to work. 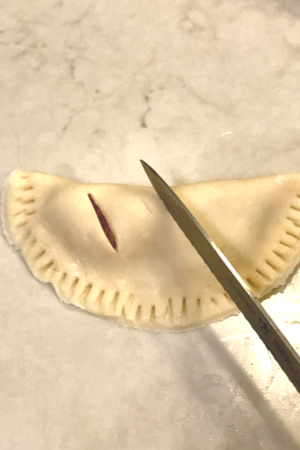 Because the pie crusts were already circular, I decided to make the hand pies into half-moon shapes. There was no time to go searching for my biscuit cutter so I grabbed a small bowl and started cutting out circles in the dough. 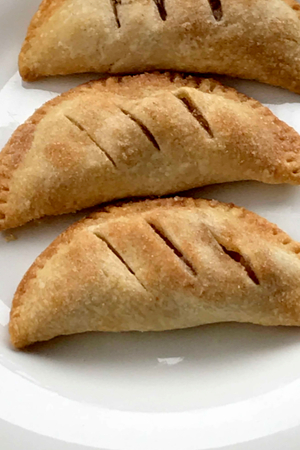 Air fryer apple hand pies with a light and flaky crust and a delicious filling. I added the apple pie filling into the center of the dough and folded them in half. A little spritz of grapeseed oil and a sprinkle of cinnamon sugar mixture and in the air fryer they went! Then in a little over 10 minutes, the Air Fryer Apple Hand Pies were ready! A quick and easy dessert was literally in our hands in less than 20 minutes from start to finish! That made a good evening even better! And for another quick and easy dessert try our Instant Pot Apple Crisp recipe. However, if you are in the mood and have the time to make a homemade pie try our Muffin Tin Apple Pies or our Cherry pie recipe. Individual apple pies that are easy to eat, using no utensil and are perfectly cooked in the air fryer. Unroll each room temperature pie crust and using a 4.5 inch biscuit/cookie cutter cut out 4 holes in each pie crust. 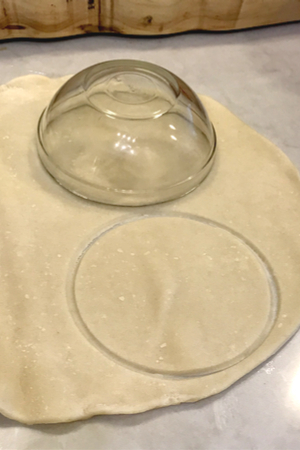 Moisten the outside edge of each circle with water. Place 1 ½ tablespoons of pie filling in the center of each circle. Fold the circles in half and press the two seams together using your fingers. Use a fork to seal the edges. Use a sharp knife to score the top of the crust three times. In a small bowl, mix together the cinnamon and sugar. Set aside. Lightly spray each hand pie with grapeseed oil. Sprinkle each pie with the cinnamon/sugar mixture. Pre-heat air fryer at 350°F. Lightly spray your air fryer basket with grapeseed oil. Place the hand pies in a single layer in the air fryer and cook for 11 minutes or until the pie crust is nice and golden. Repeat with remaining hand pies. ← Dairy Free Alfredo Sauce – Made In Minutes!